"Aside from watching the sunrise, coming down the volcano was another highlight. I had done the entire climb in the dark, where all I could see was the dimly lit path illuminated by my flashlight. I hardly knew what lay to my left or my right, however, walking down with the sun now up was a completely different experience. The landscape now revealed itself in its best light showcasing Lake Batur, green rice fields, and a lava field below. It was a wonderful sight to behold." 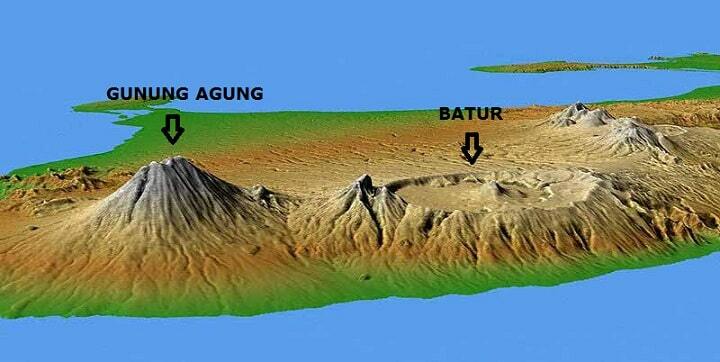 The area of Batur was made by a great big volcanic eruption about 30,000 years ago. The crater, which was left after this eruption was about 13,5 to 10 kilometres wide. In this bowl (crater), which remained behind, villages were built and there was a beautiful blue lake: Danau Batur. At the edge of the bowl are some high peaks, such as Gunung Abang (2153 meters) in the east and Gunung Penulisan (1745 meters) in the northwest with this temple Pura Puncak Penulisan. In the middle of this bowl (crater) is the active volcano Mount Batur (1717 meters) and at the foot of the volcano is the beautiful lake Danau Batur. Since 1824, this volcano has erupted more than 20 times. Since the last eruption in 2000, there is still steam coming out of the crater. Despite its activity the volcano is usually safe to climb. Bali mountains are considered sacred. After all, this is the home of the gods. When the Mount Batur erupted in 1917, Batur village was almost completely destroyed, but the destructive lava flow stopped in front of the village temple. That was seen as a good sign. The village was then rebuilt, but in 1926, fate hit again. This time only the altar was spared and dozens of people died. The village was rebuilt again and the altar was put in the new temple Pura Ulun Danau Batur. The large crater in the middle is Batur. On the far left is the Gunung Agung. Many people come to climb the volcano in the morning to enjoy the spectacular sunrise. The climb is not as difficult as that of the Gunung Agung. To enjoy the best, you need to get out of bed early. Because the guides leave because at 4am in the morning from the town of Toya Bungkah. After a long walk it's nice to take a break in a hot spring. Another town where you can start with the climbing of the volcano is Songan, which is on the north side of the lake. You can also start in Kedisan, a very small town between Penelokan and Purajati. Those, who want to climb in the morning, better stay in a hotel or guesthouse on the lake. 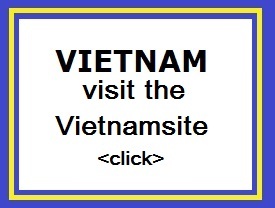 There are several accomodations for those people. Some hotels even rent bikes to tourists ,so that they also have a bike ride in the area. Kintamani, Batur and Penelokan villages sit on the rim of the huge Batur bowl about 1,500m above sea level, and offer dramatic views of the active volcano Mount Batur and serene Lake Batur. Toyo Bungkah village is down at the lake edge. Danau Batur is the largest lake in Bali, seven kilometres long and two and a half kilometres wide. 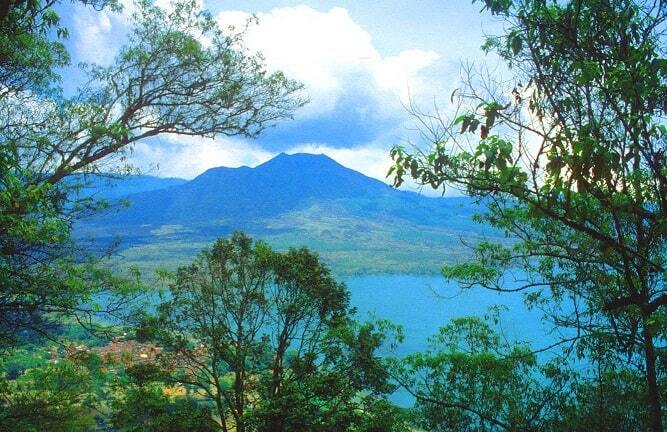 The lake is named after the volcano Mount Batur. The lake is surrounded by the crater walls of the original volcano. The lake is between 60 and 70 meters deep. Through underground rivers water is flowing from the lake Danau Batur to other places in Bali. It is very important for the irrigation of other parts of Bali, which is reflected in the proximity of the Pura Ulun Danu, the temple which is dedicated to the goddess of the water: Dewi Danu. You can take a boat trip on the lake or you can rent a canoe. On the crater rim is a 11-kilometer road, which connects the northern coast with the south coast. There's frequent traffic on this road. There are also three villages close together on this rim: Penelokan, Batur and Kintamani. 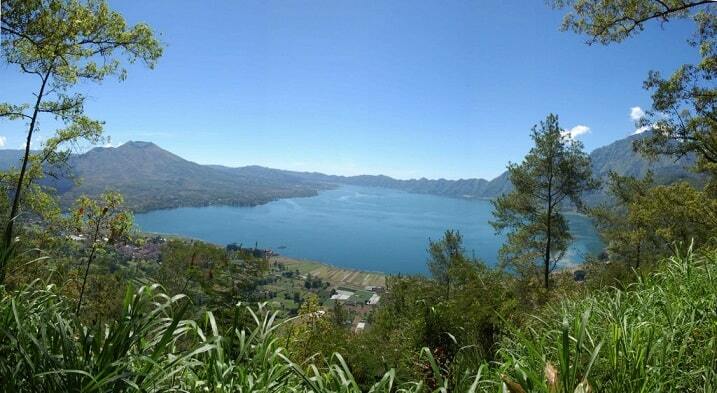 From these places, you'll have a spectacular view of the lake and the Mount Batur. In Penelokan is also a geological museum, where you can find more information about this area. On one of the peaks of Gunung Penulisan (1745 meters) on the crater rim of the large bowl is also a temple: the Pucak Penulisan. This is the highest temple in Bali (1745 meters). The temple is located 3 kilometres outside Kintamani and consists of 11 terraces. Inside the temple complex there are some ancient stone sculptures and one assumes that these remains are of Balinese megalithic culture. The admission price for entering the area of Batur is about Rp10.000 per person. This you must pay at one of the counters, when you come from Bangli or Ubud. And then, there was that morning... I mean... that night, that we woke up at 1:30AM to climb a volcano. The only time we met other Belgians was actually while climbing this mountain. So we weren't the only crazy people doing extremely active stuff at night! A lot of sweat and a bit of blood (it's not easy climbing volcanos when it is dark) later we made it to the top. Too bad we didn't realize before how cold it actually would be at the top. And yes... I have to say... very cold. Probably the only time we weren't sweating in the whole trip! But we made it before sunrise and the views were amazing, so we got a very nice reward for our effort! (And we got some nice Balinese massages later that day to spoil ourselves as well).